It seems to be an inescapable fact of life, especially in these times – the pressure to produce, reach targets and get results. A pressure which can penetrate the system, dim creativity and pleasure and reduce life to a list of gloomy ‘What to do Today’ items. Not very attractive at all! But what about disarming this outside pressure by building a greater pressure inside? Here follows a chain of thought in regard to giving value - a pressure cooker of a different kind. Value in this context does not refer to monetary value but to the humanly cooked brew of adding value, whether through encouragement, compliments, appreciation, recognition, warmth or wonder. Adding value is not really a produce but rather a process, and there is an interesting difference. The dictionary says that ‘process’ means ‘course of action proceeding esp. series of operations in manufacturing’; whilst ‘produce’ is defined as ‘to bring something into existence’ (The Concise Oxford Dictionary). So first there is a Process, a whole unseen happening of actions and reactions, and out of this comes the Produce. The wise teacher, mentor or master knows this of course, and will have their pupils process value as well as inspiration, self esteem or vision before directing them at the final produce. Examples of this can be found in the article ‘Art and Education’ (Topaz 15) or in the article ‘Children with ADHD win confidence’ (Topaz 7). Back to value, and here are two anecdotes which make some points about the matter, the first one from the weekly routine of my own household. Each Tuesday we collect a box with our share of that week’s harvest from the ecological farmer in the village. 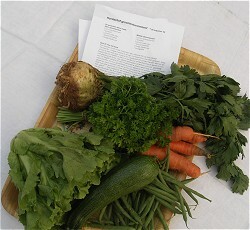 The vegetables arrive in a box, there is no plastic, not even a paper bag as a protection. They look as if they have come straight from the field. A newsletter is stuck between the leeks and the carrots, containing a vivid description of what has happened during the last week on the farm; the effects of rain, sun, wind or cold, the progress of each crop, what is anticipated for the coming weeks; and also the farming crew’s feelings and thoughts about what they do. An extract from February this year: ‘When I was cutting the winter purslane this morning it was so cold that initially I was afraid I would cut my numb fingers. But the beauty of the crops, erect and proud and yet so soft and full of fineness made everything feel right. I could have gone on for hours’. Recently there was an emergency at the farm and relatives were asked to come and help. So in the early hours of the morning there were 20 helpers who had escaped their offices to come to harvest a crop of beetroot. In a village in a cold Nordic country lives a 77 year old man who builds small waiting cabins at bus stops. During the winter this country is cold, the council does not want to invest money, but this man has decided to build his cabins as a mark against coldness in society. He finances this project from own means and transports the wood and other building material on an old moped. In each cabin he installs lights and puts in newspapers and comfortable chairs. He says: “I want people to get a nice feeling in the cabins. It is important that people feel that ‘this is a pleasant place, where I can be’. Sometimes I put out decorative objects to look at, that really adds that extra”. In one of the cabins a neighbour puts in Christmas decorations and sometimes somebody else puts in a new newspaper, some magazines or even books. This makes the man exclaim: “How special! Then I can really feel that this is ‘we’ and ‘ours’! It fills me with energy”. These examples hint that living a life with added value is far more significant than just trying to be a good person. At least three things stand out; the energetic state that occurs, the contagious feature of value (where a place that is cared for invites more of the same, as does one that is not cared for) and finally the unification and melting that it causes between people. If we could put all our personal experiences in the matter of value together and tell of them all over the globe, it would augment to a considerable bank of energy saving and problem solving resources. One personal experience can be found in Topaz 6, where Johan van Heuvel speaks about how he decided to cause easement in the life of the elderly by helping them with repairs in their homes. This was an original initiative rising out of his own pressure cooker of value. An interesting fact is that in some of the Scandinavian countries, some councils have put in place a function called ‘The Handyman’ – a man that goes round to the elderly to help with tasks that require, for example, standing on ladders. In some cases accidents involving falling have been reduced by half. I am not suggesting that Johan van Heuvel is directly behind these municipal decisions but it is inarguable that a personal initiative to add value has a chance of augmentation and globalisation in these times. It takes people who believe that what they do matters, to create good examples. There is another feature of value; it promotes understanding. An example of this is captured in the film about the life of Mahatma Gandhi. As Gandhi travels through India and his value for the country and its people deepens he starts to understand the significance and importance of wearing the national clothing in the process towards an independent India. He understands that this will strengthen self confidence in people, but he only understands this when his warmth and value has melted something in the relationship. ‘It is only with the heart that one can see clearly. What is essential is invisible to the eye’. And at these times this wise fox might just be understood perfectly.